Today, I went to a wonderful free exhibit at the Ryerson Image Centre called Remembering The Real Winnie. For those of you who don't know, A.A. Milne based his famous creation on a Canadian black bear named Winnie (for Winnipeg) that he and his son, Christopher Robin, discovered at the London Zoo in the early twenties. Christopher Robin instantly fell in love with this black bear and re-named his teddy bear Winnie. 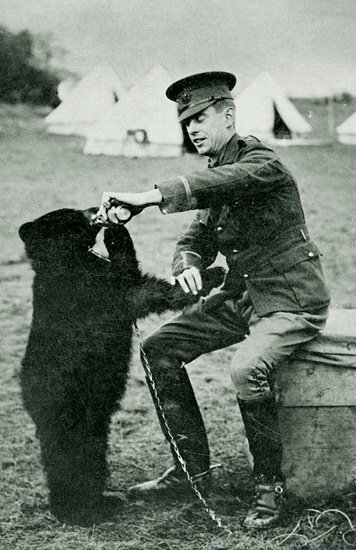 The original Winnie came to Britain with Canadian veterinarian and WWI soldier Harry Colebourn. Colebourn bought Winnie off a trapper for $20 and brought her along when he shipped out. All of the soldiers in his regiment quickly fell in love with Winnie, who became the regiment's unofficial mascot. Not surprisingly, Colebourn wasn't able to bring Winnie to the Front, which is how she ended up in London Zoo. Colebourn had originally intended to bring Winnie back home to Canada after the war, but he decided to leave her in London Zoo because she seemed very happy and comfortable there. She was certainly extremely popular. While the Remembering The Real Winnie exhibit is quite small, it's full of fascinating treasures, such as Colebourn's veterinary kit, photos of Colebourn with Winnie, and Colebourn's WWI diaries. There is also an excellent interactive website that tells the whole story of Winnie through photographs and other visual effects. It literally moved me to tears. There's also an online collection of photographs, diary entries and other gems. If you have any interest in Winnie the Pooh or the First World War, I highly recommend both of these sites.